LOS ANGELES, California, December 3, 2012 (ENS) – Ford has been forced to recall 2013 Fusions equipped with its gas-sipping 1.6-liter EcoBoost engine because they can overheat and catch fire. 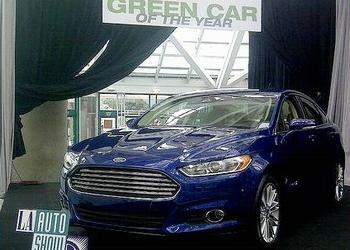 The recall comes just one day after the 2013 Ford Fusion was named Green Car of the Year at the Los Angeles Auto Show. 2013 Ford Fusions can be equipped with any one of five different powerplants, and the mid-sized sedan was named Green Car of the Year based on its wide variety of powerplant choices. Subject to the recall are 15,833 Ford Fusions with 1.6-liter EcoBoost engines produced and distributed for sale in the United States and Canada – most in the U.S. market. The recall affects only 2013 SE and SEL model Fusions equipped with the 1.6-liter engine. It does not affect 2013 Ford Fusion models with other engines. Fusions equipped with the 2.5-liter EcoBoost engines and hybrid engines are unaffected. Ford’s EcoBoost technology combines direct gasoline injection and turbocharging. “The recall comes after reports of engines overheating, followed by vehicle fires starting in the engine compartment when the engine is running; no injuries have been reported,” Ford said in a statement. Ford reports that some drivers who have experienced high engine temperatures followed by engine fires say that their instrument clusters have shown the message “Engine Power Reduced to Lower Temps” or “Engine over temp, stop safely.” Some also said that their instrument clusters sounded a chime and showed a red light. Drivers who see any of these indications should safely pull off the road as soon as possible, turn off the engine and exit the vehicle. Ford will compensate owners for costs tied to overheating as well. Ford is urging 2013 Fusion owners to immediately contact their dealers, who will provide them with loaner cars at no charge until their vehicles can be fixed. Ford still is trying to determine how to correct the problem. The 2013 Fusion, was selected for the honor out of a field of finalists that included the 2013 Dodge Dart Aero, Ford C-MAX, Mazda CX-5 SKYACTIV and the Toyota Prius c.
The Green Car of the Year jury judged the 2013 Ford Fusion to be a groundbreaker with its five diverse powerplant choices. Among them are three gasoline internal combustion engines including two with EcoBoost technology, a 47 mpg hybrid, and a plug-in hybrid that is expected to top 100 mpg equivalent. “Many have long envisioned new car showrooms where a desired model could be purchased with one of many distinctly different and efficient powertrains, selected to satisfy a buyer’s particular needs and desires,” Cogan said. Powering the 2013 Ford Fusion base model is a 175 horsepower, 2.5-liter engine that is EPA rated at up to 34 mpg on the highway. With EcoBoost technology the Fusion’s 178 horsepower, 1.6-liter powerplant achieves up to 37 highway mpg, but this is the model subject to recall. The more powerful 240 horsepower, 2.0-liter EcoBoost engine, estimated to be rated 33 mpg on the highway, was not recalled. A jury of some of the nation’s top environmental leaders, including Natural Resources Defense Council president Frances Beinecke, Sierra Club executive director Michael Brune, Ocean Futures Society president Jean-Michel Cousteau, and Global Green USA president Matt Petersen, plus Tonight Show host and auto enthusiast Jay Leno and “Green Car Journal” staff, selected the 2013 Green Car of the Year through a majority vote.